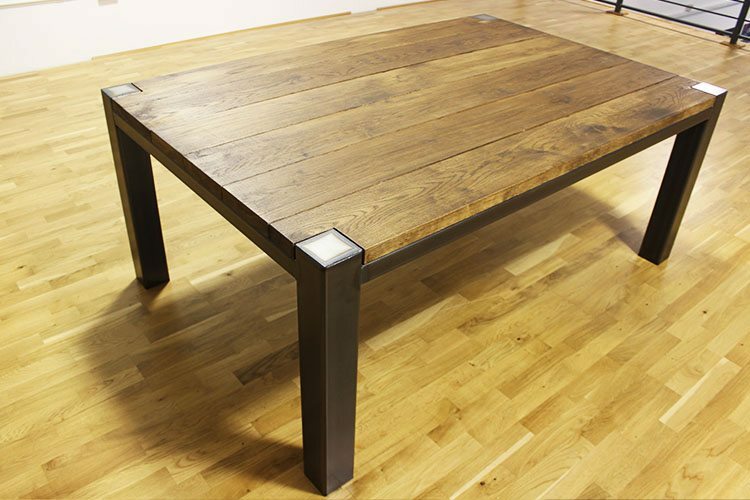 Introducing the new Hugh Industrial Oak Dining Table sitting on a solid 100mm steel frame. This table has been produced for a new client of ours in London. This furniture piece will sit amongst some prized art paintings in an old rustic luxury apartment. This table is now available to you with optional bespoke finishes and sizes. The wood used on this piece in particular were 40mm thick. A very expensive choice but very much appreciated by those who know there materials. The thick American white oak looks stunning and talks quality when put together with the steel frame. For our customers we offer the option to have thinner planks, or a solid table top version. Whichever style suits your home or office environment best. The frame for this table features a mixture of 50mm and 100mm sizes. 100mm does not come in the usual mild steel finish so we decided to go with a charcoal finish throughout the table. This provides a dark industrial turn to the table. Again this can be customised with a stainless steel version if you prefer the lighter industrial colour material. 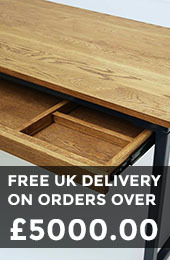 Either that or choose to have a powder coated finish to complete industrial oak dining table frame in any colour you desire. To complete this table frame a clear lacquer is applied This will protect the steel frame from rusting. However this is a treatment that does not guarantee to last for life.